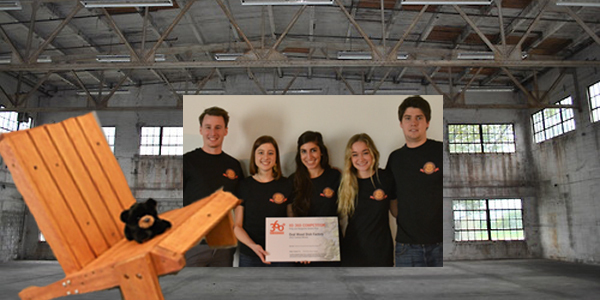 A team of five industrial and interaction (IID) students in the College of Visual and Performing Arts known as “Team Bear” won their program’s annual 360° IID Competition with a proposal to reuse a former factory in Tupper Lake, N.Y., as a brewery and beverage co-op. The 360° IID Competition encourages comprehensive research, analysis and visionary problem-solving. This year’s competition challenged fourth-year IID students to envision a creative new use for the former Oval Wood Dish (OWD) factory in Tupper Lake. On Dec. 7, five student teams presented their results to a jury of professionals in an attempt to win the grand prize, the Philip H. Stevens Award. Team Bear—Reed Campbell, Kimberly Chacra, Kara Lubsen, Alle O’Neil and Jack Taylor—created the brewery and beverage co-op The Craft Lab after a semester of thorough research, including visits to Tupper Lake and the factory, as well as regional breweries. To see how Team Bear created The Craft Lab, visit its blog at tupperlakebear.tumblr.com/. The Philip H. Stevens Award is named in honor of Stevens ’51, an industrial designer and president of Philip Stevens Associates Ltd. in Skaneateles, N.Y., who made a gift of $100,000 to the program with his wife, Margueritte. Stevens had suggested to Don Carr, professor of IID, that the students generate ideas to reactivate an idle factory for this year’s 360° IID Competition. Carr, who owns a camp in Long Lake, N.Y., in the Adirondack Mountains, decided on the former OWD factory in nearby Tupper Lake. All five teams also presented their ideas to the Tupper Lake Revitalization Committee and the local community. Judging the 360° IID Competition were Stevens; Greg Smiley, industrial design manager at the Raymond Corp.; Elet Callahan, professor of law and public policy at SU’s Martin J. Whitman School of Management; Scott Ryan, president of Brownlie Design; James Sonneborn, attorney at Bousquet Holstein PLLC; and Marcie Sonneborn ’76, G’77, G’89, small business innovation research (SBIR) specialist at the Central New York Technology Development Organization. Team advisors for the five teams included IID alumni John Lonczak ‘77, phi-d product/brand development; Jim Rudolph ’06, Farm Design Inc.; Erik Kreider ’11, fuseproject; Leigh Cohen ’10, IDEO; Tor Alden ’86 and Mike Herda ’96, HS Design Inc.; Eric Beyer, ’79, Copesetic Inc.; Bruce Leonard ’75, Kodak; Miya Teraki ’06, JDK Design; and Adam Carr ’02, Bose. Landscape architect Meaghan Pierce-Delaney also served as an advisor.